Gena Hamilton comes from a musical family. Her mother, father and all four brothers were always playing and singing together from the time she can remember. With early roots in the South on the borders of Arkansas, Texas, Louisiana and Oklahoma she is truly a Southern Girl. Early in life she sang in church and at church functions giving her a memorized catalog of hundreds of standard and classic hymns and other special songs. In school Gena studied music and participated in the High School band as a flutist and as a featured vocal performer in the school choir. As a teenager, Gena was told that she sounded a lot like country singer Connie Smith. She was not familiar with her but a friend gave Gena a recording of Connie's and after listening she smiled and said, "You know, everybody sounds like someone, but ultimately, you are who you are - your own person with your individual sound." Ultimately, Gena started to receive invitations to perform as a soloist and background singer for recordings and at various functions and musical productions locally and in the four states region. Gena became a regular on Music Country USA in Broken Bow, Oklahoma and then moved to the Oaklawn Opry in Texarkana, Texas. 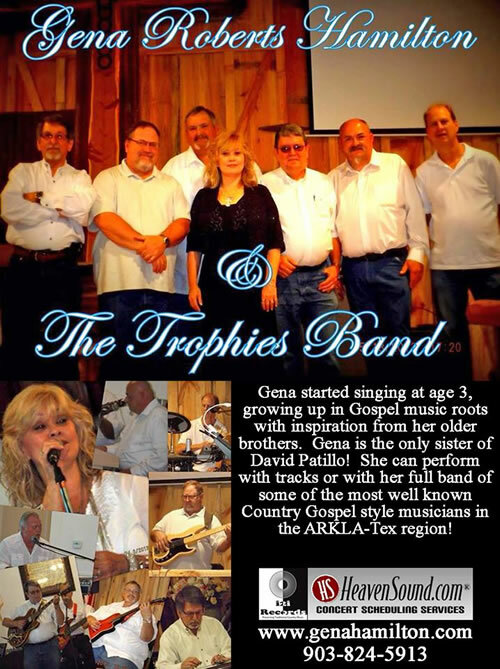 Gena's Trophies of His Grace CD was officially released Dec 15, 2013 at the Circle J Cowboy Church in Texarkana, Arkansas in full concert with the Trophies Band. It was officially debuted on television on March 12, 2014 on Southern Gospel Praise in Dallas, Texas on the UAN Network. By mid-July the single cut Higher Ground had reached #30 in the major charts and by August 1st had reached #1 status. Gena is currently working on her second combo Country and Southern Gospel CD plus also a new Country Christmas CD. Gena has recently released a new Christmas single and will be releasing a new single in January with Canyon Creek Records. Gena has opened for such traditional country stars as Jo-El Sonnier, Barbara Fairchild, Chuck Hancock, Chuck Day, Joy Roberts, Jeff & Sheri Easter, The Williamsons, The Hootens, Mary Fay Jackson, Ava Kasich, Wade Benson Landry, Tommy Horton, David Patillo, Psalm 100, Tommy Brandt, Jimmy Jack Whitiker, John Randolph, John Lanier, Jesse Reece, John Penney, Kenny Serrat, David Cook (Elvis Tribute Singer), Lonnie Spiker, Joe Stampley and George Hamilton IV. Gena has appeared on many Branson stages, including appearances at the Branson Terry Awards, Little Branson Gospel Shows, The Baldknobbers Theater, God and Country Theater and the Doug Gabriel Theater. She's appeared on stage at The Gospel Opry in Sulphur Springs Texas, The Gape Fest, and at Singing At The Point for a Cure, as well as an Anniversary Show hosted by Joe Bielenski in Will Rogers Coliseum in Fort Worth, Texas. She appeared with an all-star female cast at the Texas Women in Country Music's Pickin' for the Cure, held at Pearl's Historic Dance Hall in Ft. Worth, Texas. Gena has had the privilege of appearing on the Oaklawn Opry Stage with Tommy Cash (John's Brother). 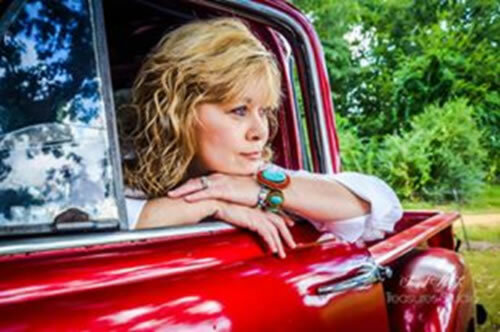 Her radio and television appearances include Southern Gospel Praise TV, Marty Smith Heavens Country Radio and The Josie Show. For high-quality country gospel music, look no further than Gena Hamilton, one of today's top country gospel artists! To book Gena now, please contact her manager using the information provided at the top of this screen.